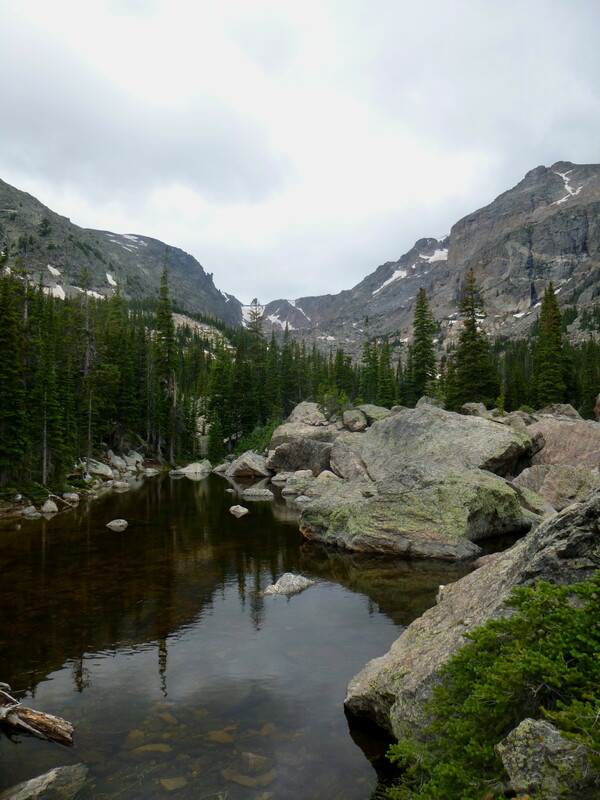 For all its wonders, Rocky Mountain National Park boasts relatively few half-day to day loop hikes, so the Lake Haiyaha loop described here stands out as an exception (for a full-day loop hike, try the Fern-Odessa-Cub Lake loop). 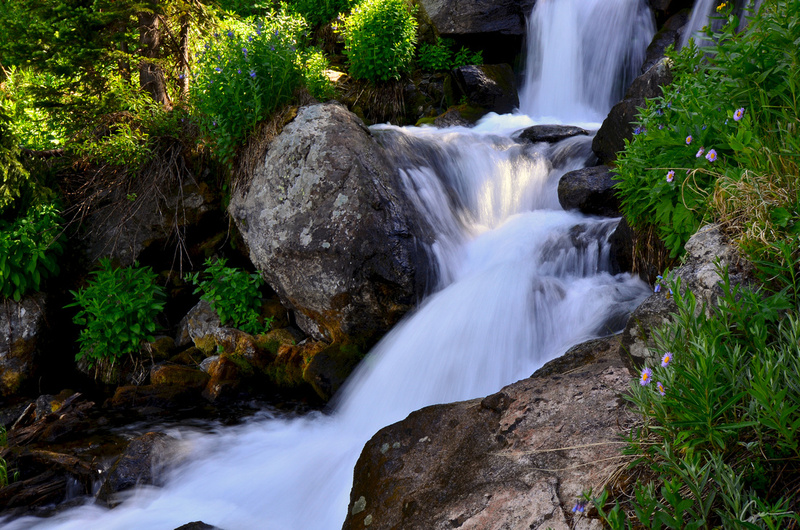 In addition to Haiyaha, the loop hits several other notable destinations, including Alberta Falls and Dream, Nymph, and Bear Lakes, as well as several stunning viewpoints along the way. The mile section between Lake Haiyaha and Dream Lake provides arguably the best views of the Bear Lake/Glacier Gorge area and certainly the best of Nymph and Bear Lakes from above. Lake Haiyaha is notably less well-travelled than its comparable cousins—Mills Lake, The Loch, and Emerald Lake. 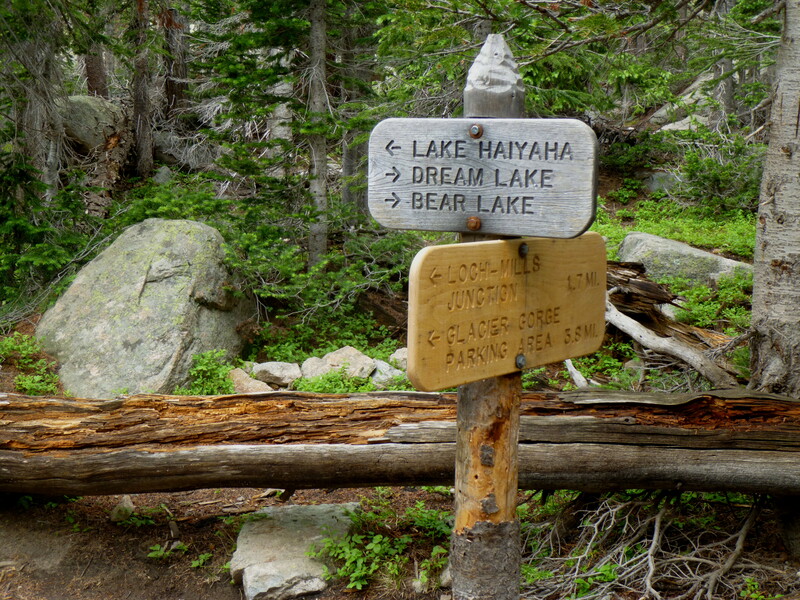 You can choose whether to start this hike from Bear Lake or from Glacier Gorge TH as well as decide whether to hike counterclockwise (via Bear and Nymph Lakes to Haiyaha) or clockwise (via Alberta Falls to Haiyaha). 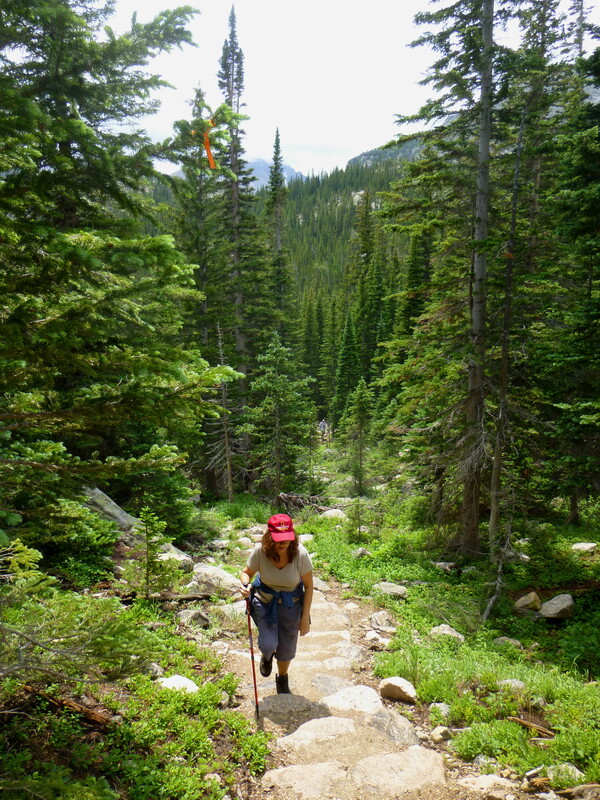 On the Saturday afternoon in July when I hiked the loop, we began at Bear Lake, caught the connector trail down to Glacier Gorge (0.5 mi., mostly downhill), then ascended via Alberta Falls. The 0.8 mi. from Glacier Gorge TH to Alberta Falls (or around 0.5 mi. 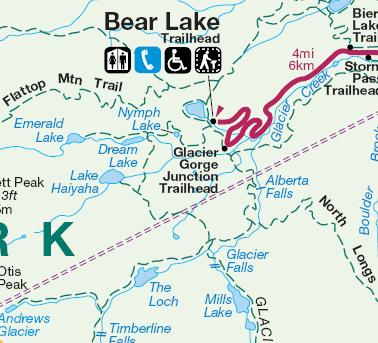 remaining from the Bear Lake connector trail) involves a gradual ascent along the western flank of Glacier Gorge and is described in greater detail here. 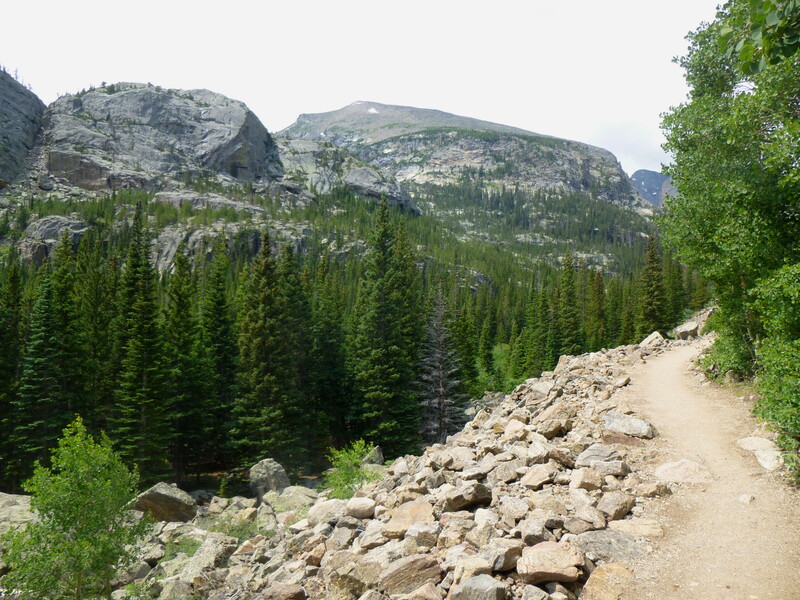 From Alberta Falls, the trail veers off to the right and continues climbing almost immediately. After a short diversion, Glacier Creek again returns to view around 1/3 mile up from Alberta Falls, though the trail is noticeably higher above the ravine at this point. The creek, riddled with boulders, is roaring as usual. Speaking of boulders, the trail itself beyond Alberta Falls is quite rocky, at least much more so than the smooth climb to Alberta Falls. 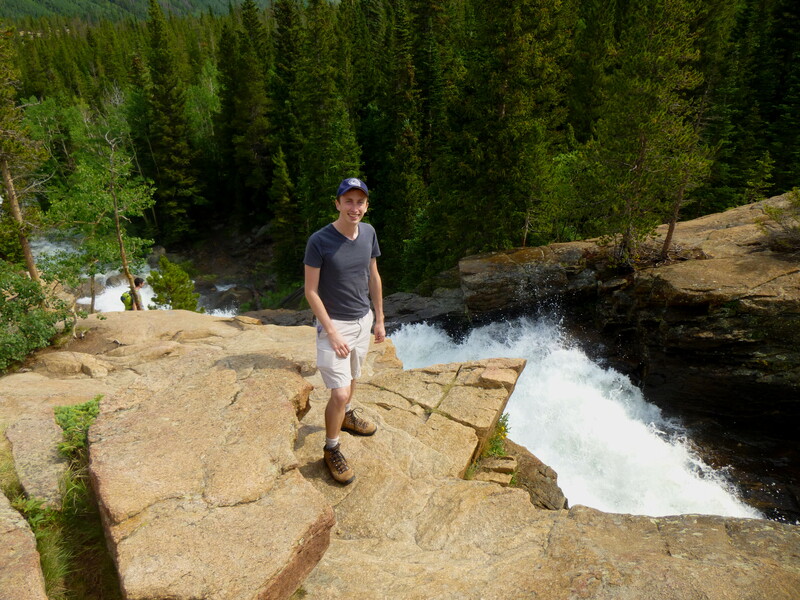 But eventually, as you crest the “top” of the Alberta Falls section (at the junction with the North Longs Peak Trail; 1.7 mi. 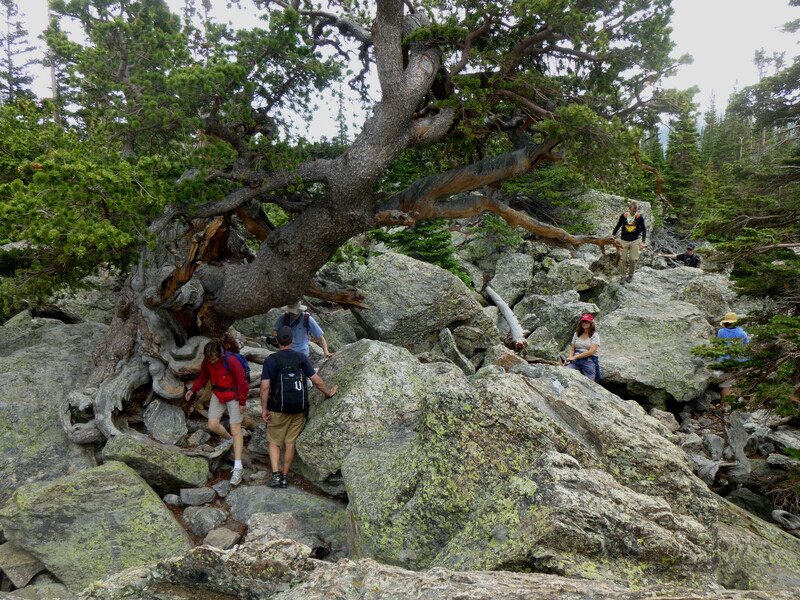 from Glacier Gorge TH), the path is much less geologically-diverse. At this point, Glacier Creek is far calmer and largely hidden from view among the coniferous vegetation off to the left. 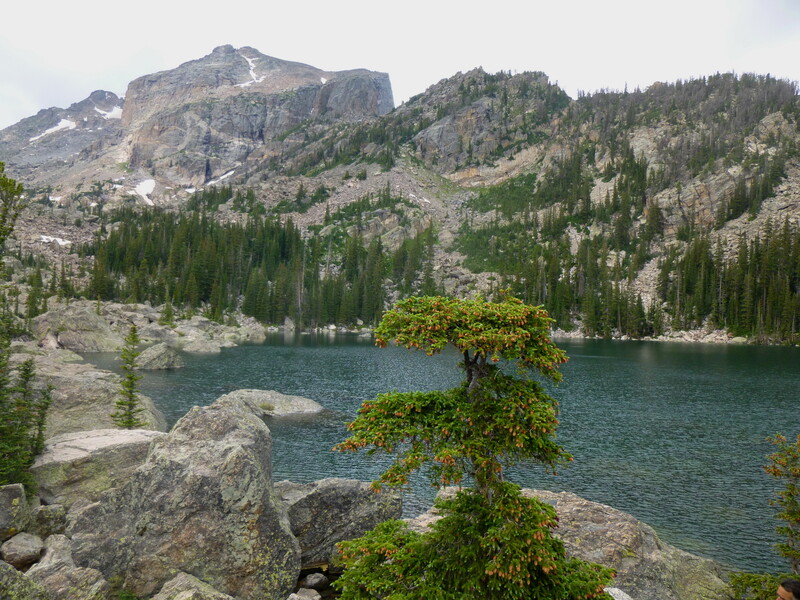 As the trail continues west, you can easily spot the granite shelf marking the second steep section of Glacier Gorge (beyond which is Mills Lake), but the hike to Lake Haiyaha does not veer quite that way. After about ½ mile of relatively level hiking, trekkers will reach a trail junction. To the left is the short but steep ascent to Mills Lake (0.6 mi.). Go straight for Loch Vale (0.8 mi. 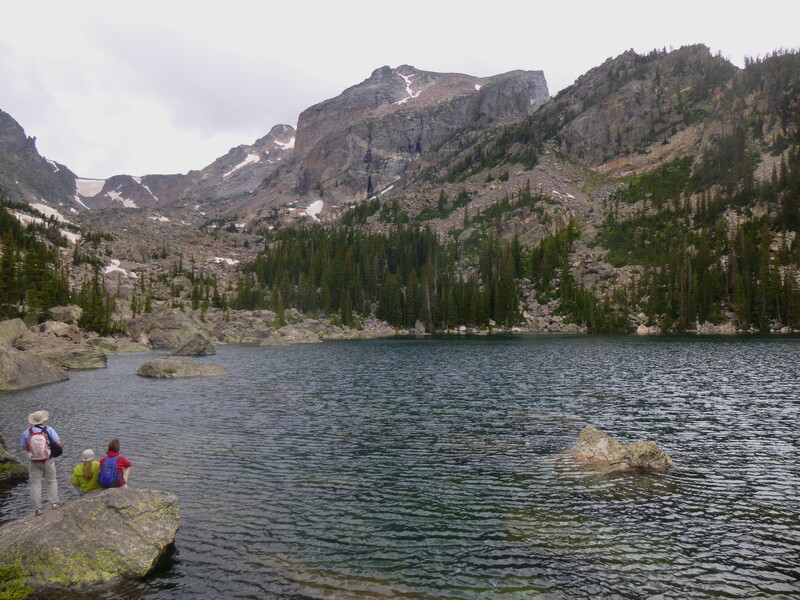 ), and head right to Lake Haiyaha, 1.9 miles from this point. Almost immediately after the junction, the crowds (heading largely for Mills Lake and Loch Vale) become noticeably thinner (though on a summer weekend, it will be by no means empty). 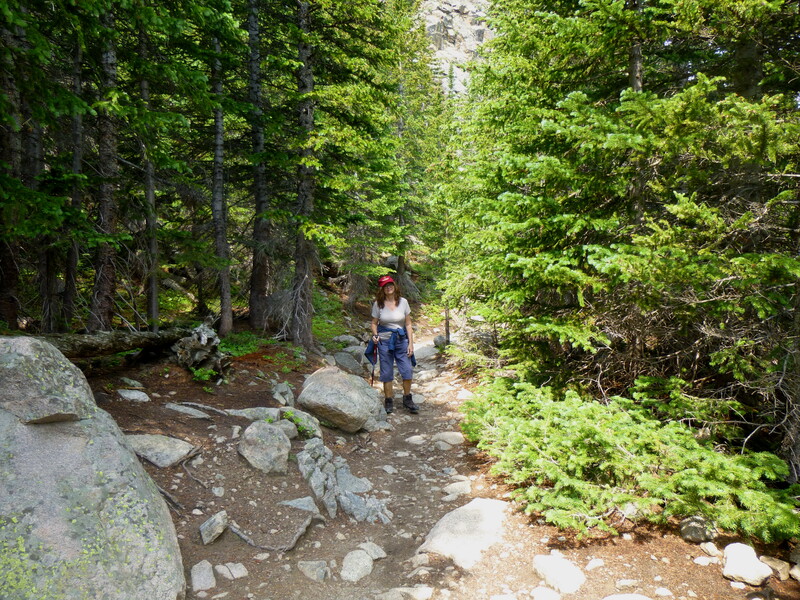 The trail dips up and down along the edge of Glacier Knobs (10,280’) through rather thick forest with a strong smell of pine. The path crosses at least two small streams on its way to Lake Haiyaha. Following a final push up a rather steep section, a sign denoting “Lake Haiyaha” is both encouraging and deceptive, as it is still a 1/4-mile (mostly level) walk from here to the lake. Finally out of the trees, a small, shallow, rock-populated pond appears on the left…but have no fear! 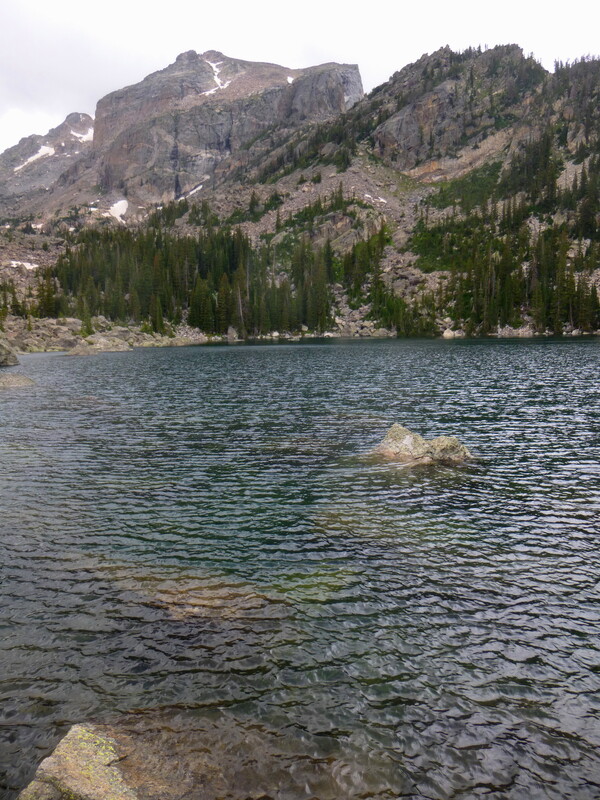 The much deeper and grander Lake Haiyaha is just beyond, about 500 feet further up the trail. With 4 miles of hiking and a short bit of rock scrambling behind, finally it’s time to relax with a view of the lake. 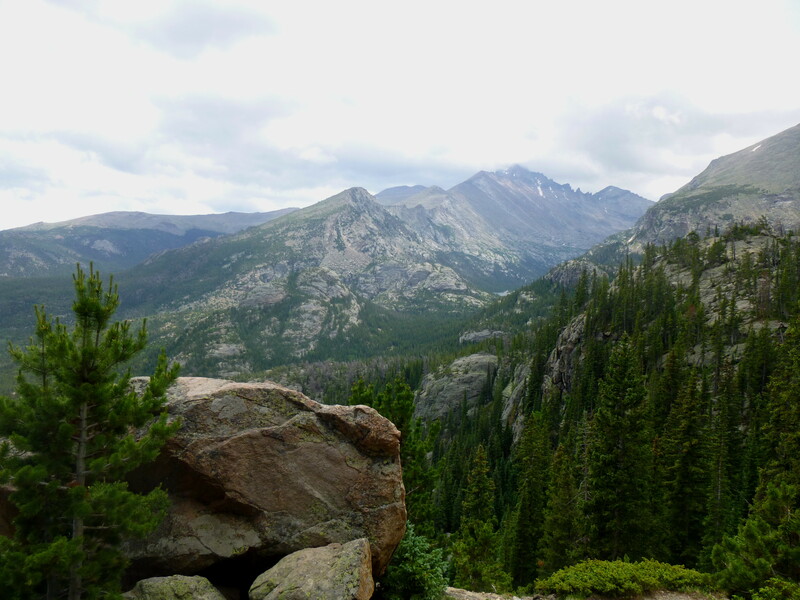 Hallett Peak (12,713’) and upper Chaos Canyon (the latter is rather easy to get to and explore) unfold beyond. Alas, for yours truly, it wasn’t to be. On the afternoon we hiked to Lake Haiyaha, the clouds were not so kind, and the fear of getting caught in a thunderstorm hurried our time at the lake. Returning on the spur trail, turn left at the junction. From here, it is about 2 miles to Bear Lake (and 2.75 from Glacier Gorge), but the best is yet to come. After crossing Chaos Creek (a bit of bushwhacking downstream here will lead you to Chaos Canyon Cascades), look to the right for a series of stellar views of Glacier Gorge and Glacier Basin unfolding below. 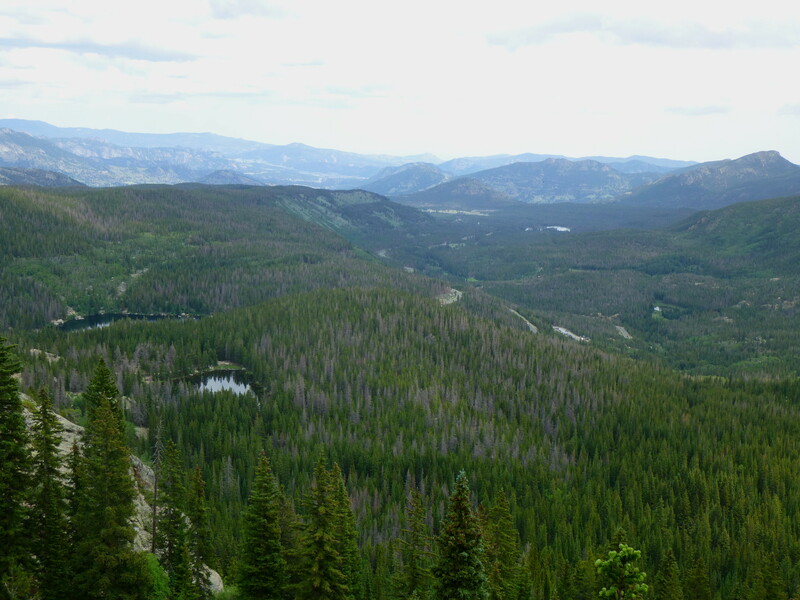 Here you can get a beautiful glimpse of Nymph and Bear Lakes from above, as well as Sprague Lake off into the distance. About 1/2 mile from the Lake Haiyaha spur trail, the path begins to descend steeply down into Tyndall Gorge. Through the trees, you can glimpse parts of Dream Lake below. After a mile, the trail levels off and meets up with the Emerald Lakes trail. The rest constitutes the “homestretch.” During the mile-long downhill, Haiyaha hikers assimilate with the masses hiking to and from Dream and Emerald Lakes, past Nymph Lake and down to Bear Lake. 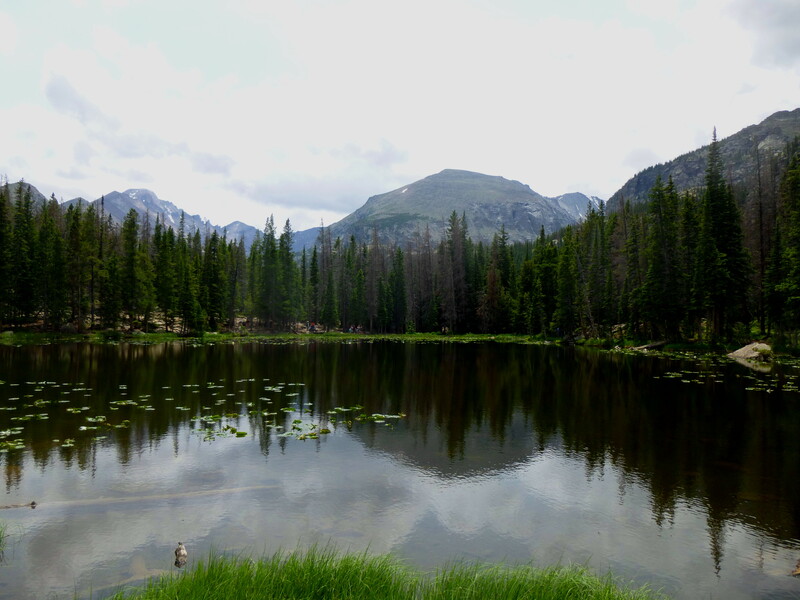 In my case, we reached Bear Lake (where the car was parked) just before it began to rain. To finish the loop down to Glacier Gorge TH, simply turn right at the Bear Lake parking lot and follow the gradually descending path for 0.75 mile back to your car/shuttle. 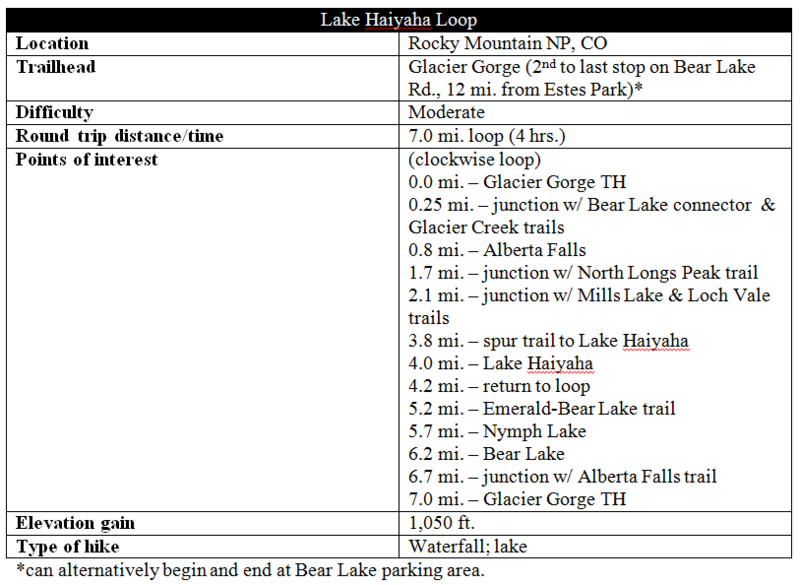 All in all, if doing the full loop, allot at least four hours; more if you hope to explore a bit at Alberta Falls or Haiyaha. 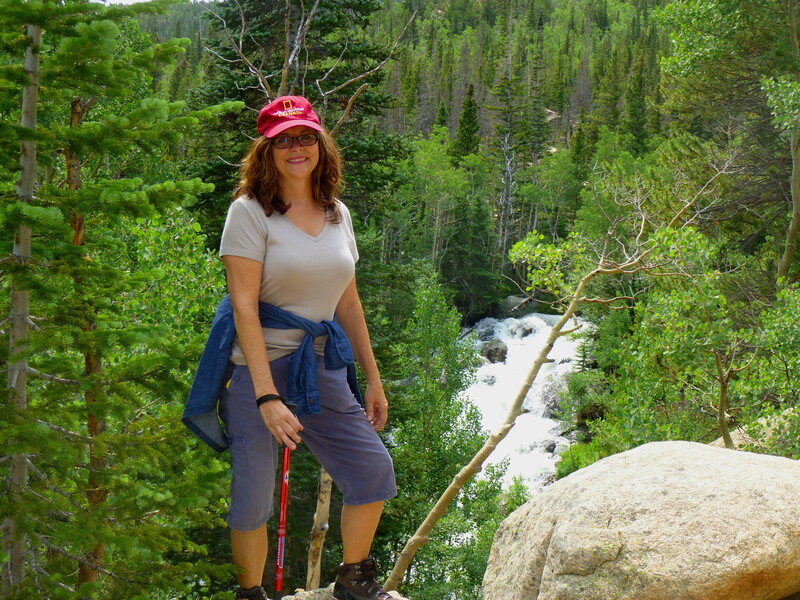 This entry was posted in Colorado, Moderate Hikes, Rocky Mountain National Park and tagged Alberta Falls, Bear Lake, Colorado, Dream Lake, Glacier Gorge, Glacier Knobs, Haiyaha, lake, Lake Haiyaha, Loch Vale, loop hike, Mills Lake, Nymph Lake, Rocky Mountain National Park. Bookmark the permalink. We were in the very same place in early August. Love it!